I just finished The Tale of Hill Top Farm by Susan Wittig Albert and enjoyed it very much. It is a fun mystery. 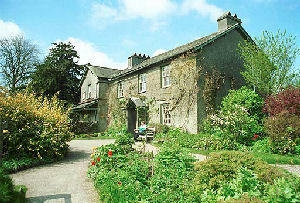 Beatrix Potter has just arrived in the town of Near Sawrey in the Lake District after purchasing Hill Top Farm. She is "on leave" from her demanding parents and grieving the death of her fiance, Norman Warne. She is drawn in to the intrigues of village life and which include a mysterious death, a missing church register and a school roof fund that appears to have been stolen. Parts of the story are seen through the eyes of the village animals as well as the famous animals Beatrix brings with her. This part of the story works very well and should make the books popular with animal lovers. Albert has done extensive research into Potter's life and has tried to imagine what she would have been like at this point in her life. Having just finished the book which happens at the beginning of her life at Hill Top farm I was interested in this article about the National Trust's current plans to break up the extensive farm. Prince Charles is lending his voice to the debate. The tenant farmer, Jonny Birkett, who has been the steward of the farm is dismayed. "I've always given the National Trust top marks for trying to save farms, but now they're just going against what they're meant to be about," he said. "It's a disgrace. This is one of the best farms in the Lake District and we've always looked after it as if it was our own. "We've spent years doing everything they've wanted us to do, without ever asking for anything. Now they've just come along and said 'That's it.' They haven't even given anyone else the chance to take it over." I almost had a heart attack reading this post. Potter's farm is one of my dearest memories from childhood. We visited when I was 6 and again when I was 10. It is one of the most beautiful places in the world. I'm appalled ! I can hardly believe the National Trust are selling off Hill Top after Beatrix Potter left it to them... Ooh, I could just spit ! I heard Susan Albert speak last month at a book signing. I think she said one factor in the National Trust's decision was the concern that Beatrix Potter's sheep were not "native" to the area and they want to restore the countryside to its pristine pre-farm state. ??!!?? I need to check on this.